My first thought was: how could I choose between osoberry and skunk cabbage? 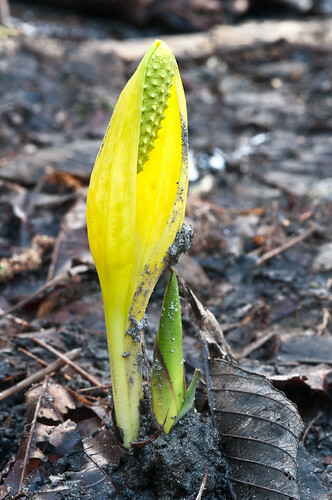 Both are very early bloomers, the first plants you’ll see blooming in the forest — skunk cabbage starts appearing in early March. North Beach Park looks like a terrible wreck during the late winter: all the seeps look highly eroded, the leaves have rotted, everything is all twigs and branches. When these plants start appearing, I feel a sense of relief that it’s going to be all right. But soon enough, osoberry is joined by red-flowering currant (another early-blooming shrub), then a number of shrubs burst out at roughly the same time, and osoberry blends into the shrub layer until late August, when it’s one of the first to drop its leaves. However, skunk cabbage remains distinctive, and that’s why it’s my favorite. Its leaves are bigger than anything you’d expect outside of a tropical rain forest (four and a half feet/ 1.5 meters), which makes it stand out all season long. In the wet areas it thrives in, there isn’t a whole lot else growing. There have been times when we’ve cleared an area but been unable to plant it in the fall, only to see it come back lush with skunk cabbage in the spring. In the ancient days, they say, there was no salmon. The Indians had nothing to eat save roots and leaves. Principal among these was the skunk-cabbage. Finally the spring salmon came for the first time. As they passed up the river, a person stood upon the shore and shouted “Here come our relatives whose bodies are full of eggs! If it had not been for me all the people would have starved!” “Who speaks to us?” asked the salmon. “Your uncle, Skunk Cabbage,” was the reply. Then the salmon went ashore to see him, and as a reward for having fed the people he was given an elk-skin blanket and a war club, and was set in the rich, soft soil near the river. Here are all the photos on Flickr tagged “skunk cabbage.” The variegated purple ones are Eastern Skunk cabbage, and there’s a white one that looks like Calla lilies to me, but the one around the PNW is the yellow-flowered one. I also have a favorite groundcover, Pacific Water leaf (photos) and a favorite fern, maidenhair fern (photos).